UP Police 2018 Result – Uttar Pradesh Police Recruitment and Promotion Board, Lucknow, has declared the UP Police Final Result 2018 at uppbpb.gov.in on February 18, 2019. The result has been announced for the written exam held on June 18, 19 and October 25, 26, 2019 and PET?PMT held from December 06 to 10, 2019. The candidates who have appeared in the examination can check the result now. The result is announced in the form of pdf contains all the details of selected candidates. A total of 41520 candidates selected on the post of Nagarik Police and Constable. Get here all the details of UP Police 2018 Result. 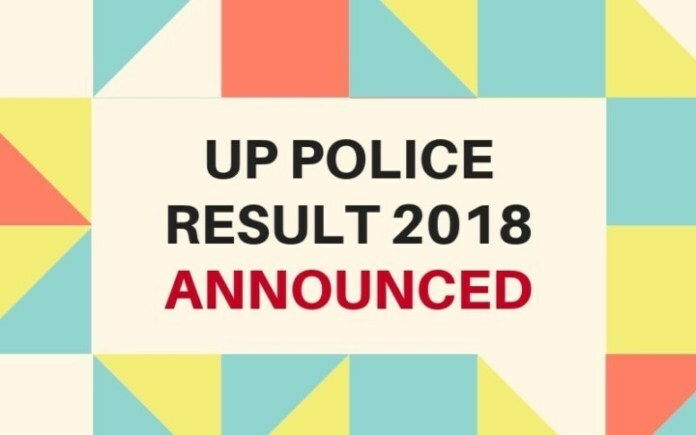 Latest: UP Police 2018 Result has been announced. Scroll down to check the result. UP Police Recruitment Board has announced the UP Police 2018 Result for direct recruitment of constables in UP Police. Candidates who had appeared in the examination for recruitment to 23520 + 18000 (41520) posts can check the result from the link given below. Click here to download the UP Police Bharti 2018 final Result (Complete Result). Written Result: Click here to check result of UP Police Bharti 2018 and download DV / PST admit card. Heartiest congratulations to all who have qualified. Here are some instructions for you. Those who could not clear this time, do not lose heart. You will surely do well in your other attempts. Candidates may note that official link to check result is https://cdn.digialm.com/EForms/configuredHtml/1339/56001/login.html. When you go to http://uppbpb.gov.in/, you can see that the latest notice is ‘Link to download admit card of qualified candidates for document verification and physical standard examination in UP Police 2018 Recruitment.’. When you click it, you reach https://cdn.digialm.com//per/g01/pub/1339/ASM/WebPortal/1/[email protected]@[email protected]@1#! which is the official portal exclusively for UP Police Constable Recruitment 2018. Here, you will see the latest notice says ‘Result declared, qualified candidates can login to download their DV/PST Admit Card’. Click on the link that says ‘Click here for Result Generation’. 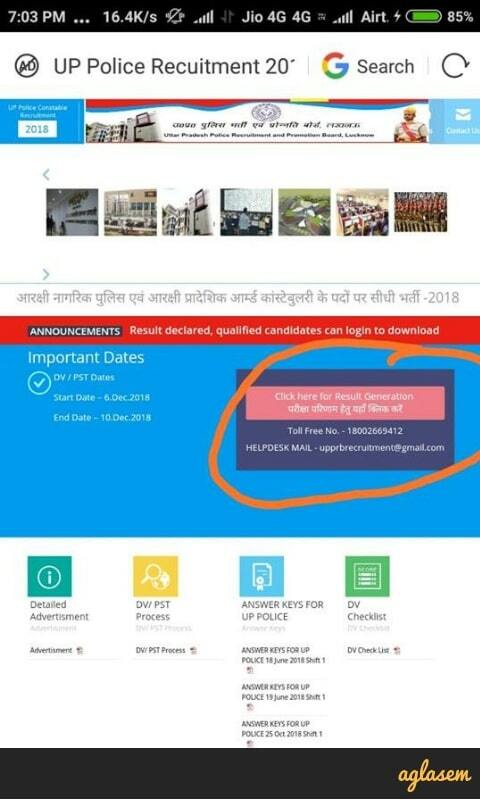 It takes you to the login page for UP Police Result 2018. UP Police 2018 Result: Candidates can login to check result at uppbpb.gov.in, prpb.gov.in. Please note that initially, it was seen that the official link to check result was https://qa-efmprd-g01.digialm.com//EForms/configuredHtml/1339/56001/login.html. However now the new link is posted above. Best of luck for your result! Please note that those who have qualified can also download admit card for document verification from same link. 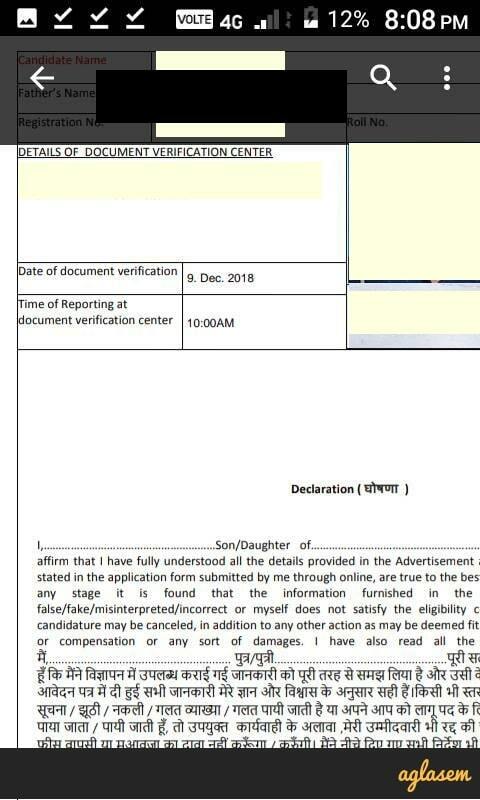 UP Police 2018 Result: A candidate shares a screenshot of his DV admit card. UP Police Result 2018 was supposed to be out on December 4, 2018, at 2 PM, as per the notice released yesterday (December 4, 2018). Today, that is on December 5, 2018, the board released final answer keys in morning. Then at around 8 PM, the board published result. However even then the result was not accessible due to some technical difficulty. After some time, result link became accessible for all through official websites uppbpb.gov.in and prpb.gov.in. 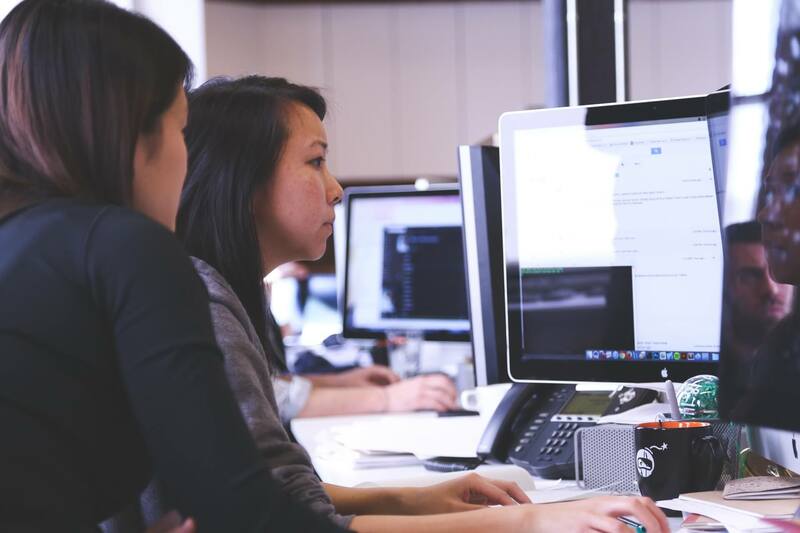 The cut off is the minimum marks which the candidate need to obtain in the test. The cut-off marks to qualify the written examination for UP Police 2018 has been decided by the Board. Those who have scored less than the cut off marks shall not be allowed to proceed to the next stage of the recruitment process. As per result of written exam, candidates with following cut off marks have qualified. Check complete cut offs from notice given below. As per last year reports, a total of 38315 candidates qualified the written examination. As of now the date for declaration of the result are not yet announced. However, as soon as it will be available, the same will be updated on this page as well. Click here to download the pdf of the above notice. The result announced last year for recruitment of 41,610 Police Constable in UP was challenged by many candidates. 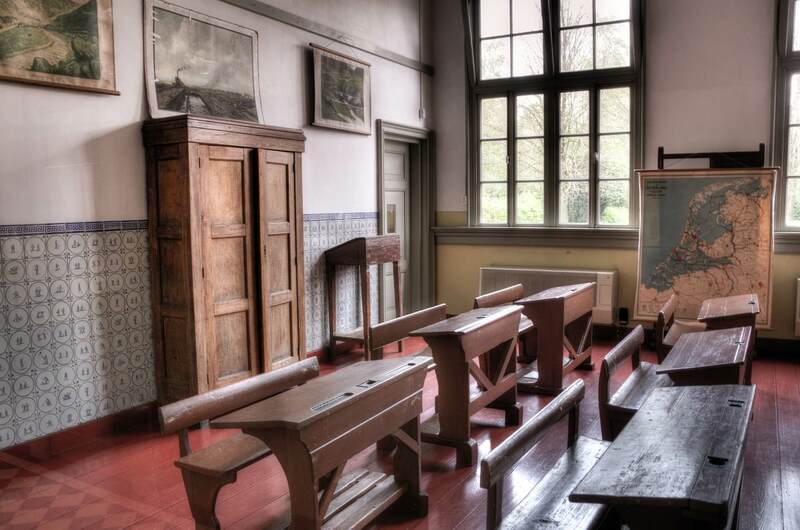 Around 38351 candidates managed to qualify the written exam. 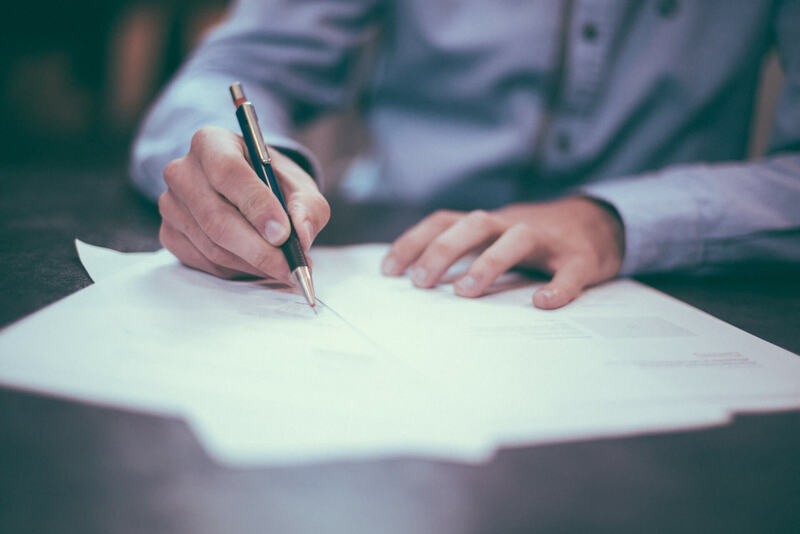 However, about 6254 number of candidates were removed from the list of successful candidates over the use of whitener in the exam paper. In other cases, an OBC candidate scored much above the lowest cut-off marks but was declared non-selected. When he protested, his marks were reduced to lower than the cut-off marks within an hour. The written paper was of 300 marks and the physical endurance test (PET) was of 100 marks. But at no stage, the marks obtained by the candidate in the PET were declared separately. Also, there were many issues related to the application of rules of reservation. Click on the link which will be given on this page as soon as it will be available. Enter details such as Roll Number, Date of Birth to check the UP Police Result. On submitting the details the result will appear on the screen. The candidates may take a print out of the result for future reference. The UP Police Merit List will be released after the declaration of the result. There shall be separate merit lists for each category. Ranks will be allotted on the basis of marks in the Result of UP Police Recruitment. Those will qualify all the stages of the recruitment process will be appointed for the post of Police Constable. Ex-servicemen should have unit discharge certificate, no objection certificate by the unit commandant, Indian special army certificate of education issued. For Female Candidates- Complete a race of 2.4 km in a maximum of 14 minutes. 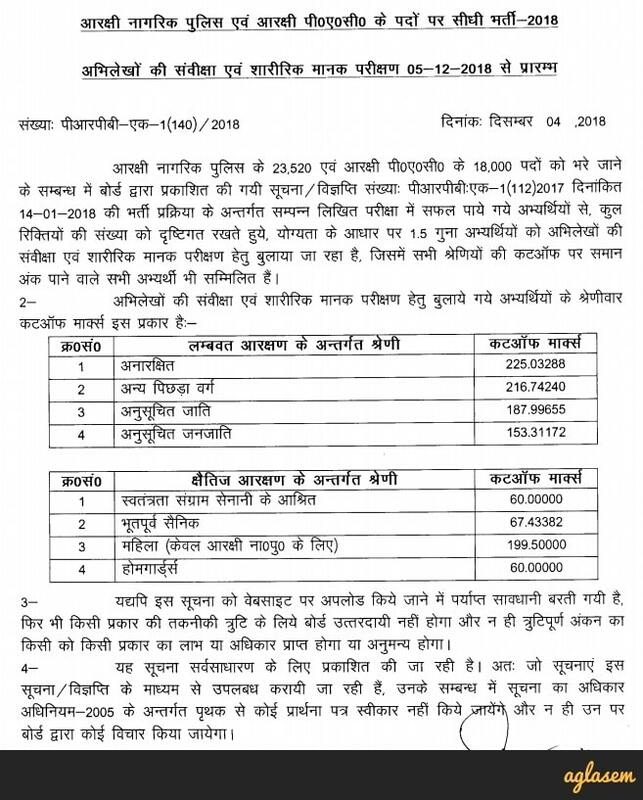 What is the pay scale for UP Police Constable Recruitment 2018? The selected candidates will be eligible to receive a monthly salary between Rs 5,200 to Rs 20,200, with a grade pay of Rs 2,000.